The 2012 campaign trail is heating up, but President Barack Obama put away his election rhetoric to lend his support to the Aurora, Colo., shooting victims. 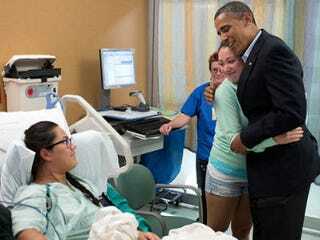 From the University of Colorado hospital on Monday morning, according to the Guardian, Obama gave a message of support to the victims and promised that the public's focus on the shooter would wane, while the people who were hurt would still need the country’s help. Speaking to reporters at the hospital, which is near the scene of the massacre at the Century 16 movie theater, Obama acted as "comforter in chief," just as he had in the wake of the 2011 mass shooting in Tucscon, Ariz., that wounded Rep. Gabby Giffords (D-Ariz.). Beginning his speech by quoting Bible Scripture, Obama said that he had been deeply moved by his experience talking to victims and their relatives. "I come to them not so much as president, as I do as a father and husband," he said. Obama described hearing a story of how one young woman had saved the life of her shot friend by remaining in the cinema, stanching the bleeding with her fingers, as the rampage continued. Such stories of bravery and survival were a comfort amid the tragedy, Obama said. "Even in the darkest of days, life continues and people are strong and people bounce back and people are resilient." Obama's speech was also notable for what he did not say. He deliberately avoided mentioning the suspected killer's name. And he gave no sign of entering into a political debate over stricter gun-control laws that might prevent the mass shootings that seem to have become a regular part of American life.